A new friend I recently made here in the Capital is also a Singaporean himself. So one day, he told me about a hotpot restaurant that we should head over that day. 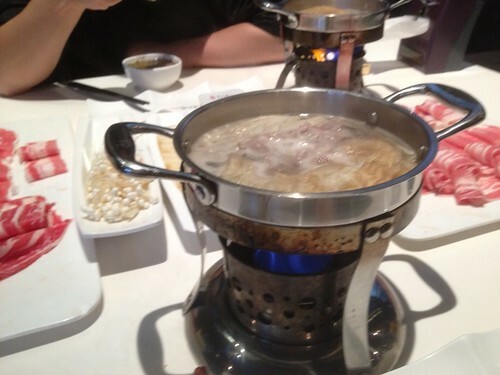 Hotpot. Nothing new right? Ahh... but this one has Bak Kut Teh hotpot. The place is only 4 subway stops away from my location with a little walk of about a kilometer or so. We reached a restaurant and was greeted by a poster of Eric Tsang (曾志伟) posing with a frying spatula. Not sure if he has ownership of the restaurant or just hired to be a spokesperson. We ordered the Bak Kut Teh hotpot (duh) and the rest e.g. meat, veggie had to be ordered separately. We ordered an extra portion of youtiao, of course. The pot arrived and I dipped my spoon into the hotpot for a taste of the soup. Yup. It's Bak Kut Teh alright, with a couple of pieces of bak kut and youtiao thrown in for good measure. Not peppery at all but than again, the bak kut teh soup is meant for hotpot cooking. My friend, Yandaokia, ordered one particular dish that I originally thought was 水晶包 (crystal dumpling) because of it's grey and glossy appearance. However, the glossy part of it is due to the "slime" which suggested that the round spheres were uncooked. We popped these babies into the pot and within minutes they turned whitish pink. Orrrrhh..... prawn balls har!! Nice!! Very fresh!! My only gripe was that when the soup was running low and needed to be topped up. They refill the soup using regular soup stock thereby diluting or even killing off all traces of the Bak Kut Teh goodness. At the end of the meal, the soup that remained has turned into regular soup albeit with all the goodness inside. The bak kut teh soup was all gone. In all, the meal was pretty good and with a jug of beer, the bill came up to almost RMB 300 which worked out to be around SGD 30.00 per person. Still, I feel that it is worth the little indulgence once in a while. p.s. I may be wrong about them topping up the soup with regular soup stock rather than bak kut teh. It could be due to all the goodness from the meat and veggie that I no longer able to taste the bak kut teh.